Successfully Added Quad Band Swivel Cell Phone - GSM/GPRS Multimedia Phone to your Shopping Cart. 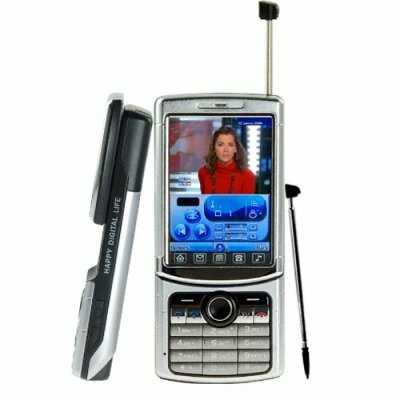 Quad band (850, 900, 1800, 1900) GSM/GPRS swivel type multimedia cell phone with Dual SIM, TV and FM radio, plus Bluetooth as its primary features. Having a crisp 2.6 inch WQVGA display and built in stereo speakers, this is one multi media phone that deserves to be recognized for its creative design. Not only does the display screen rotate, but the images/videos on the screen change from portrait to landscape mode. This is a one of a kind feature that is sure to dazzle your friends as well as your own eyes as you see the pictures automatically change with the orientation of the screen. With native quad-band GSM capability to keep you connected in more than 150 countries, this is a mobilephone you can truly use around the world. Add to that the provided dual SIM slots allowing you to have two phone numbers in the same phone, and its like you can have two full featured cell phones packed into one! Unlike some multimedia phones, this one is not locked into any particular network carrier, so feel free to use this unlocked cellphone with whatever carrier you prefer. Contained within the user friendly software interface of this model are a multitude of features such as analog TV, FM Radio, MP3/MP4 player, digital camera, digital video recorder, image viewer, sound recorder, and Ebook reader. The internal micro SD card slot already contains a 1GB card, so the phone comes out of the box ready to start taking pictures and loading up ringtones. A great mobile phone at the usual low Chinavasion wholesale price, order your stock today and prepare to be amazed at the latest in Asian media cell phones. Excellent phone, all my friends just love it. Need to get case and other accesories. on 2008-11-29 19:56:14 This phone is a great value for the price.